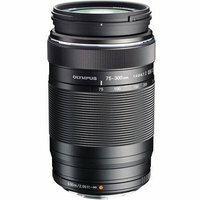 The Olympus 75-300mm f4.8-6.7 II M.ZUIKO ED Micro Four Thirds Lens Black is a telephoto lens designed to bring you closer to the action. Extremely compact and lightweight it offers an equivalent range of 150-600mm on a 35mm film camera. It comes with a unique screw drive mechanism, which is especially quiet for shooting films and has a very fast auto-focus function (MSC) for taking rapid-fire still shots. This portable 4x telephoto lens is ideal for portraiture, sports and wildlife photography.